Nothing says "I mean business" like a formidable 4x12 cab with an almighty head perched upon it. 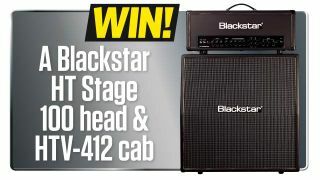 And now, thanks to the fine folk at Blackstar Amplification, you could snag yourself a beastly HT Stage 100 head and HTV-412 cab to match. With four EL34 power valves providing a 100-watt output, there's no venue the Stage 100 can't demolish, especially combined with the HTV-412 cab's quartet of 80-watt Celestion drivers. The Stage 100's three footswitchable channels plus voice switches provide a gargantuan range of sounds, further enhanced by a built-in digital reverb, speaker-emulated output and Blackstar's Infinite Shape Feature, which allows you to transition between British and American tones.